Senator Chuck Grassley is an American Republican politician who has been the senior Senator representing Iowa since 1981. He is among the longest-serving and oldest Senators in the Senate. Grassley is proudly a farmer by profession and prior to his election to the Senate in 1980, he worked a number of jobs including as a sheet metal shearer and an assembly line worker. Senator Chuck was born Charles Ernest Grassley on the 17th of September 1933 on a farm in New Hartford, Iowa, where he was also raised. He was born to Louis Arthur Grassley and Ruth (née Corwin). Grassley attended and graduated from the high school in his locale before proceeding to the Iowa State Teachers College where he earned his Bachelor of Arts degree in 1955. A year later, in 1956, he earned a Master of Arts degree in Political Science from the same college which is now named the University of Northern Iowa. While studying for his degrees, Chuck Grassley worked several jobs including as a metal shearer and as an assembly line worker. From the mid to early sixties, Chuck Grassley taught Charles City College. He started his PhD work at the University of Iowa but ceased before graduation. Chuck Grassley was elected to his first political office in 1959 when he served as the Member of the Iowa House of Representative from the 73rd district. He went on to represent other districts before joining the United States House of Representatives where he served from 1975 to 1981. He became the US Senator from Iowa in 1981 and has been reelected 6 times. His committee assignments have included the Committee on Agriculture, Nutrition, and Forestry, the Committee on Finance – of which he was the chair from January to June 2001 and later from January 2003 to December 2006. 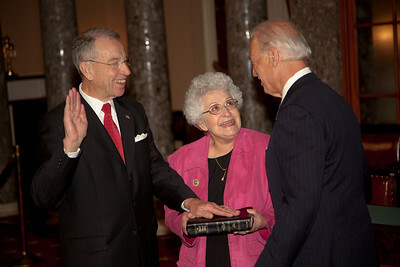 Following the 115th Congress, Senator Chuck Grassley became the chairman of the Judiciary committee. Thanks to research results provided by the nonprofit group, Center for Responsive Politics, the public is in the know of how much politicians are making. In Senator Chuck Grassley’s case, his net worth of $3.3 million is high enough to rank him in the top half group of the richest US Senators. The bulk of the farmer’s wealth stems from his farmland in Butler County, Iowa with an estimated value which falls somewhere between $700,000 and $1.7 million. Grassley proudly shares images of the progress of crops on his farmland on social media. In addition to the agribusiness, Chuck Grassley also invests in other sectors including real estate. Within the space of a decade from 2005 to 2015, financial reports show that the Senator invested about $2.3 million in real estate. Within the same time frame, $21.8 million was invested in crop production and over $17 million in “other investments”. According to a graph by Center for Responsive Politics showing Grassley’s estimated net worth within the decade, his wealth peaked in 2007 when his net worth was estimated at over $4 million and reached an all-time low of $2.5 million, mainly due to the recession. Grassley’s personal real estate include; a 3-bedroom townhouse in Arlington, Virginia, which he bought in 1994 for approximately $375,000. The total value of the property is now estimated at over $740,000. He paid off the mortgage on the property in 2012. The Senator also owns a home in Beaver Township, Iowa which he bought on April 14, 1998, for $101,500. Chuck Grassley is married to Barbara Ann Speicher and together, they have five children including Lee, Wendy, Robin, Michele, and Jay Grassley. Grassley’s family have done a good job following in his footsteps. His son Robin Grassley runs his farm while his grandson, Pat Grassley launched a political career and is now a member of the Iowa House of Representatives. Chuck Grassley is a Baptist and a member of The Family, the organization that organizes the National Prayer Breakfast. The Senator has had a long-running feud with The History Channel which he criticizes for lack of actual history programming. His membership of the Butler County and State of Iowa Historical Societies, says a lot about his knowledge of history. Grassley exercises frequently and includes running in his routine. He is afraid of heights, a fact his wife revealed while stumping for him during his 2016 campaign.